The last few months have been truly shitful and I’ve been feeling weighted down by it. Not one, but two of my family members have been diagnosed with cancer and are both currently waiting for treatment. Like we haven’t had enough cancer in our lives already. An amazing guy I met nine years ago lost his life on one of our great mountains, leaving behind his beautiful wife and son. With heavy heart, I counted each of the eight steps she slowly took across the stage to reach the podium, where she courageously spoke at his funeral. She incredibly did this in front of what seemed like over a thousand people who came to pay their respects to him. I couldn’t help but be drawn to the sounds of their infant son chat away through the service. My friend Mel continues to bravely trudge through her twelve months of chemo for Hodgkin’s lymphoma and a stem cell transplant without knowing if she has reached remission. She will be tested late August. On a personal note, I am still grappling with ongoing health issues of the post treatment variety. On Tamoxifen my ovaries are behaving like they are on IVF. Hyper-stimulated and painfully cystic. I have withdrawn from the half Ironman triathlon race I entered. I’m not running anymore and I’m sleeping lots. At the moment, alot of my life appears to be sore and it hurts when I move it. 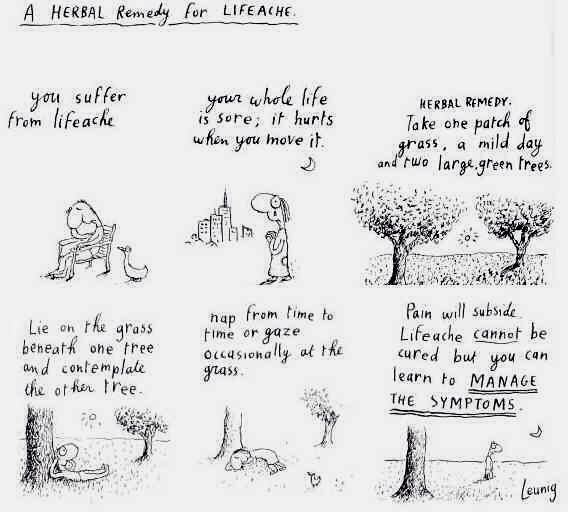 This “Lifeache” cannot be cured, but apparently one can learn to manage the symptoms. So I give thanks to the trees and to Michael Leunig, and to my wise friend who (in a timely fashion) posted this Leunig cartoon on Facebook last night.